No sweat...no kidding. 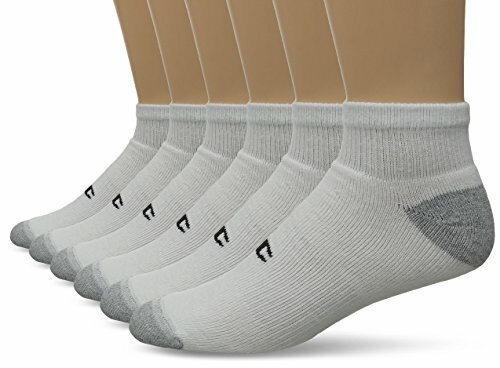 These Champion men's athletic socks keep your feet cooler and drier no matter how hard you play. Soft cotton-rich yarns provide all-day breathable comfort. Double Dry fabric technology wicks moisture for constant cool. Plush inner sole cushions your every step. Reinforced grey heel and toe resist wear & tear. Smooth non-chafe toe seam goes easy on your skin. Popular ankle length with stretchy ribbed stay-up tops. NOTE: Sock size 10-13 fits shoe sizes 6-12. Soft cotton-rich yarns provide all-day breathable comfort with spandex for better fit. Double Dry moisture wicking technology wicks sweat and controls moisture buildup so feet stay cooler and drier. Arch support for secure fit and stability.